Amybeads: Practice Makes Perfect and other beady goodness! Every weekend, I try to set aside several hours to just bead. Then I bead like crazy for a few hours, catch up on some of my Hulu shows. I take pictures and have grand plans of blogging about my weekend.... then on Sunday night, I put together my to-do list for the week....Monday comes around and the train starts moving at full speed....then here we are on Friday afternoon and I"m finally finding a moment to pull those pictures off my phone and blog a little!!! But after a bit of practice this weekend I am feeling more comfortable with creating these layered shapes! Now I just have to decide what to do with them! 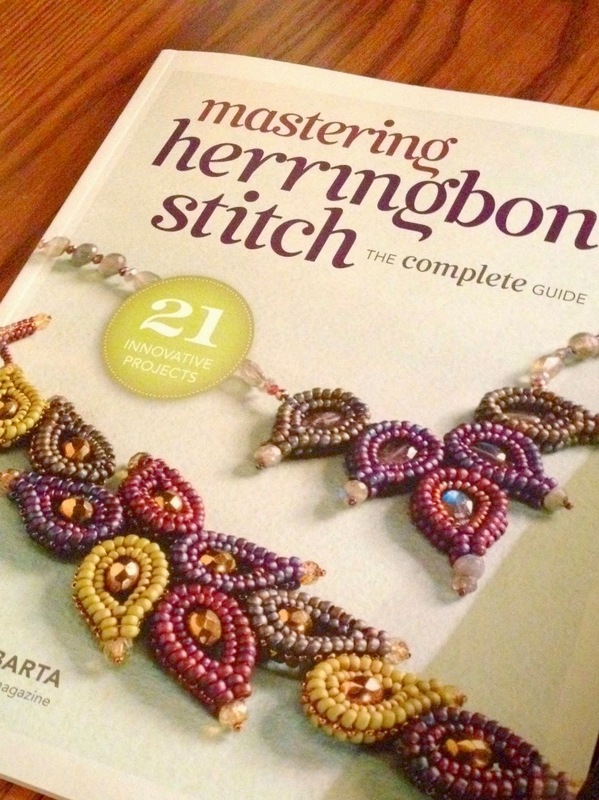 Thanks to a credit I had sitting in my Amazon account, this week I also treated myself Melinda Barta's new book: Mastering Herringbone Stitch: The Complete Guide . I came to herringbone stitch late in my beading life and could use some more instruction and guidance. The projects in this book look fantastic and I can't wait to try them!!! In other news....there is a new issue of Creative Spark available. ZNet challenged designers to create something spring-y and there is some great design inspiration in the issue! See you tomorrow for Focus on Life Week 12! I know just what you mean about good intentions, it happens to me all the time. I have not done dimensional peyote in a long time yours look fantastic. Enjoy your new book. Fantastic bead woven geometric figures. You sure have some mad skills with the seed beads!!! The little beads look perfect!!! Enjoy the book, it looks very interesting! It always amazes me what can be created with those little tiny beads. Yours look great. I'd say you have that stitch nailed! I saw that book last weekend at the bookstore and nearly brought it home with me as well :) It does look really great! i have long wanted to try those dimensional shapes...i need to put them on my to-do bead list! yours are beautiful! there are so many options for these. i am going to cruise the links now while i sip my coffee. Happy Weekend, Amy!!! Love your dimensional pieces! You could always put them on a fine ball chain. I know what you mean about meaning to get to things. Time always has a way to vanish for me, too, and I always have the best intentions! Hope you're doing well. We're still waiting for spring here!